The ultimate show car metal polish! Most people with daily drivers would be happy with the finish created by MetallWerk™ Fine Aluminum Polish, but we just had to offer this option for the perfectionists. Wolfgang MetallWerk™ Concours Aluminum Polish creates an absolutely stunning shine on bare aluminum, chrome, and stainless steel. If you need to prep a car for a show or just for showing off, you can’t go wrong with this metal polish. Wolfgang MetallWerk™ products will restore, clean, polish, and protect your metals. Micro fine diminishing abrasives are ground to a dust, literally like a jeweler’s rouge. This polishing powder is blended with a paste base to cling to vertical surfaces, such as wheels and the sides of trailers. The polishing agents scour the surface, refining it to a smoother and smoother gloss until it is as smooth and reflective as a mirror. Wolfgang MetallWerk™ Concours Aluminum Polish is formulated for bare aluminum. Just like polishing paint, you have to use the most abrasive polish first and then refine the paint to a smoother and smoother gloss. To achieve the ultimate shine, you must first polish the metal with Wolfgang MetallWerk Aluminum Compound (for severe oxidation) and then Wolfgang MetallWerk Fine Aluminum Polish. Many people would be satisfied after these two steps but if you want the jaw-dropping, high luster finish, follow up with Wolfgang MetallWerk™ Concours Aluminum Polish. Before (left) and After (right) results from using Wolfgang MetallWerk™ Concours Aluminum Polish. Apply Wolfgang MetallWerk™ Concours Aluminum Polish with a dual action or rotary polisher, or by hand. If you are polishing a large trailer, airplane, or RV, you will find it much easier to use a polisher. Don’t stop short of the ultimate shine. 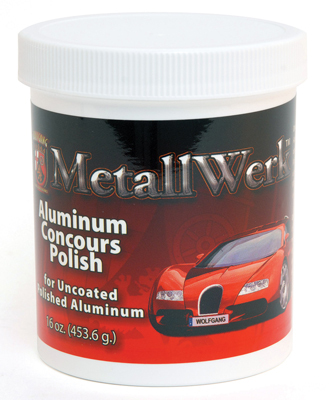 Wolfgang MetallWerk™ Concours Aluminum Polish creates a mirror bright finish on pre-polished bare aluminum. For application to small areas, you can use Mothers PowerBall or the Flitz Polishing Ball on your electric drill. Put an Electrified White Sheepskin Pad onto your polisher. This pad is 8.5 inches and requires a 7 inch backing plate. Wipe a thin layer of Wolfgang MetallWerk™ Concours Aluminum Polish onto the desired surface using an applicator pad. Polish at 1000 RPM (or 4 OPM on a dual action polisher). Polish until the aluminum has a mirror-bright gloss. * If using a Mothers PowerBall or Flitz Polishing Ball on an electric drill, polish at 1000 RPM. Wipe the surface clean. Use a Cobra Microfiber Towel or Bonnet to go over the entire surface for a gentle final buffing. This will remove any remaining residue and further enhance the gloss. Wipe the polish onto desired surface with a soft Cobra Microfiber Applicator Pad. Rub briskly until a high gloss is achieved. Buff with a Cobra Microfiber Towel. Wash used pads and towels in a mixture of Wolfgang Polishing Pad Rejuvenator and water. Allow them to soak for several minutes and then rinse. Air dry or machine dry on low. apply a thin layer of polish onto the surface. with your rotary to work in the polish. before turning on the polisher. Polish until you acheieve a high gloss. if you missed any spots. As you’re working, check the wool pad periodically to make sure it has not become caked with polish. This also makes the pad less effective. With the polish turned off, lay it on a sturdy surface (like the ground) pad side up. Turn the polisher on and hold the polisher still with one hand while you hold the Duo Spur against the wool with the other hand. You don’t have to apply much pressure.